I am saddened beyond words. Billy’s beautiful life greatly influenced my life and the lives of countless special needs children subsequently under my care. He was kind, funny and personable.I will never forget him coming to speak to a class of future educators at WCU. He was poised, calm and very informative. He was a dear sweet man. Thank you Billy for all you taught me. Billy had such a gift for making others feel special and loved. His life has been such an influence on me and on my career. I feel like a part of my heart left this earth with Billy….but I know that he would want me to live out his example by welcoming others and being happy every day! Oh, no, I am so sorry. I’m sorry I have not been to visit lately. I will see you Saturday. RIP, Billy, from Charlie and me. Billy was a very,very dear man and he and his mother were an inspiration to so many folks around here. My husband and I are still living in our wonderful home that Tom built 28 years ago when we first met the Shulz family….you are in our prayers and we offer our heartfelt sorrow for the loss of a very special man. Our family, as well as our church family at Sylva First United Methodist, was so sad to hear about Billy’s passing. Such a special light he was! Billy was loving and so loved. Jane, you and the rest of your family are in our thoughts and prayers. Jane, I have such fond memories of you and Billy at Sylva First UMC. It makes me smile to think of Billy – what a special soul from God that was put on this earth to touch so many lives! My sister is Pollye Pruitt and I learned about Billy some time ago when she told me about him. I am so sorry to hear that he is gone. I read your mother’s book “Grown Man Now” and was so impressed by her strength and determination to assure that Billy suceeded as a “Grown Man”. She gave me hope and inspiration for my own special needs son who will one day soon be a grown man. My thoughts and prayers will be with her and all of Billy’s family and friends over the coming days as you say goodbye to such a extraordinary man. 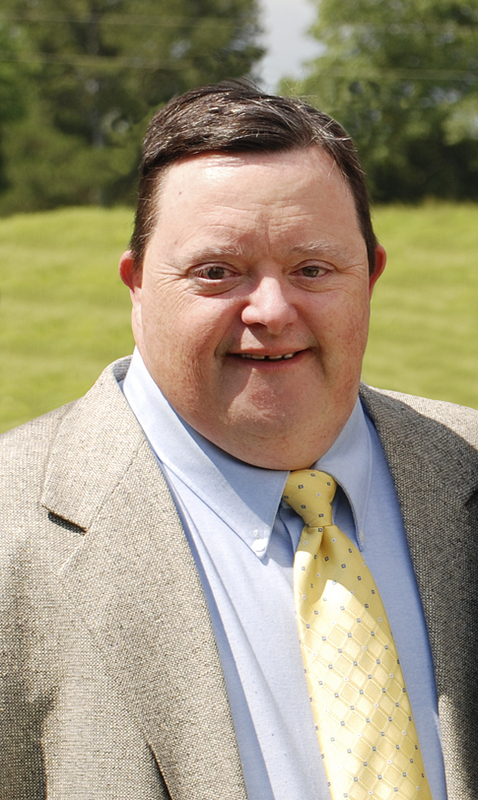 I met Billy while taking special education classes at WCU. He had such a sweet spirit and was so motivational. Dr. Schultz and her work with Billy and other students were such an inspiration to me and shaped so much of my philsophy about education and the true meaning of leave no child behind. So sorry for your loss, Billy was always kind and would make sure that you was smiling before you left foodcity, he would always help no matter if you needed it or not and every time I would take my boys with me he would make sure to say hi and talk to them. Billy will be missed but not forgotten he touched every one he came in contact with and made them smile. I often think of Billy and his Mom as I work with Children that have great disabilities. Jane was my mentor when I started teaching and taught me so much in how to get what I wanted and what the kids needed. Billy taught me that I should never underestimate what a child can accomplish with help. His sense of humor set me free in my approach to teaching and helped me continue all these years. Billy was lucky to be born into the family he has and his family was so very blessed to have him with them all these years. My thoughts and prayers are with them. Happy travels Billy, wish we could see the pictures. I always remember Billy’s smile at Food City! He was so kind and always made ME smile. Kingsport lost a great man. Billy was truly an inspiration to many – – – I was always very humbled to watch him work out our S.H.O.U.T! classes and to share his outlook on life. Billy always smiled and used “gifts” to help others. To God be the glory and thanks for his mom – – – a true servant leader in every since of the word. Billy Schulz was a quiet hero. Without always knowing it, he made the world a better place for so many people. And many of those people, who like Billy need the love and support of others to to live a full life, are benefitting from a man that they never knew. Billy, you did good work on this earth. Now, rest in peace. Billy always asked how I was and how my wife, Kim, was doing even though a lot of time would pass since he had last seen me. I have never known a person with so much joy and compassion for others and I’ve always wished I were more like Billy. Billy was fortunate to have a wonderful family and they were fortunate to have him. We were all fortunate to know Billy and we will all miss him. Billy inspired so many people including me. I know he will continue to do so through the legacy of his presentations, Grown Man Now, and the thousands of lives he touched. I will miss you Billy but know that you spread cheer through the heavens. I met Billy this spring at WCU at a presentation he and his mom made on campus. I also knew Billy as a young student at WCU in the 80’s. He was an inspiration then to me and became a bigger inspiration when my first born son was diagnosed with Down Syndrome 23 years ago. David is now a student at WCU in the UP Program which I feel is as a legacy of Billy and Dr. Schultz’s work. Billy will always be the inspiration to my David who reminds me so much of Billy in so many ways. My heart is broken but I know that heaven has wlecomed another angel home. Both Billy and Jane served as presenters for the NC Center for the Advancement seminars, Teaching Every Child: Inclusive Classrooms. They both touched many, many teachers’ lives. One teacher’s comments reflect the power of their presentations: “I am so thankful to all of the presenters. Some made me realize how important diversity and inclusion are and some made me realize the kind of teacher I hope to be.” Please accept NCCAT’s condolences to all of Billy’s family and friends. Billy was such an inspiration to many people. I was grateful to get to hear his life story at WCU. What a blessing and encouragement his story was to me! Thank you Billy! Oh my dear Jane, you know this breaks my heart so…you were such an inspiration when my daughter Erika was born 20 years ago with downs syndrome. I saw what Billy was doing and how he had touched the community and I had hope that no doctor had given me. As a mom that has a very special child I am scared and saddened to think of the future of my Erika I am also blessed as you were by an amazing human being that keeps everyday in prespective for me. Jane thank you, thank you for paving that road for me and others and thank you Billy for just being the best example of human kind…and I know you are probably running the heavenly chior right now. Sing on Billy and keep an eye on all of us. Billy is gone but what Billy was will linger with those of us who knew him for as long as we live. While Mother Nature was not kind to him, he more than any person I have ever known made the most of what he was given. Our memories of what Billy was will continue to brighten our lives and serve as a reminder of the positive difference a person who is authentic to the core, whatever his innate abilities, can make in the lives of others. Thirty years ago, I worked at the A&P in Sylva, where Billy and Jane were regular shoppers. The entire A&P gang loved Billy. He always had a smile and a good word for us. I’m sure Billy, like everyone, had his bad days, but in the seven years I worked there, I honestly don’t ever remember him being in a bad mood. He was and is an inspiration. I’m so sorry to hear of his passing and I think it’s absolutely a miracle the way his spirit will live on in the lives of all those who were lucky to meet him during his journey through this world. My heart goes out to Billy’s family at this great loss. Billy touched the lives of so many people and will be fondly remembered by all. This is the saddest post in the whole world. I am so sorry for your loss. Billy has inspired me and encouraged me. You will never know how many hearts he has touched. The greatest compliment I ever received was from Billy. Many years ago we were at a get-together at his parents’ home and he looked at me and said, “Sandra, you are so beautiful!” He made my day! It was from his heart and was not based on anything superficial. I needed that then, and it touched my heart! I will never forget Billy and his jokes, his sunny disposition, Tom Jones, and his smile! I have not seen Billy in many years, but he has always been in my heart! Billy, you were beautiful! I and other members of our Faith and Arts class at Myers Park Baptist in Charlotte often cite to each other spiritual lessons we learned from Billy via his brother, a class member. Billy influences how we treat other people, strangers, in places such as the check-out line at a store, for example. Then, when I finally met Billy, I found him so easy to connect with and became a Facebook friend. It all was a privilege — and one I never will lose. Thank you, Billy. ..So sorry to hear of Billy’s passing. He was always so friendly & nice to me when bagging my groceries may GOD bless you and comfort you! Jane and Family, We are so very saddened by Billy’s passing. He was a very special person and impressed everyone he met, with his wonderful sense of humor. He will be sorely missed by everyone who knew him. Jane, we are thinking of you, we are super busy this weekend and will not be able to be there, but you are in our thoughts and prayers, we love you. also – I remember one time he bought me a rose and gave it to me in the check out line. Made my day. May God comfort you and give you peace. I can’t say enough about everything Billy gave to me but he was my teacher! I will always love and cherish Billy’s memory! I love you and I am very sorry to hear of Billy’s passing. He had a great life thanks to the best mom and teacher in the whole world. I am thinking of you-together you both touched the lives of so many people and made a difference in this world. I will forever appreciate and love you both. We are so sorry to hear of Billy’s passing. We have our fond memories of our special friend Billy to hold in our hearts. We send Jane and the family our deepest sympathy and please know, you all are in our prayers. I am so sadden to hear of Billy’s passing. I started my career at the FC in Colonial Hgts.. Billy and I would laugh and take breaks together. Even after I went to a different FC I would stop by to visit my old store. We always greeted each other with a hug and a kiss on the cheek. He was an amazing man and will be greatly missed. If everyone in this world was like Billy then the world would be a much better place. I am not sure if he had any idea of how many lives he tocuhed but they were endless. He was so loved and always will be. My sincere condolences. R.I.P. sweet Billy. I just heard this sad news and I cannot imagine this world without Billy in it. Our deepest sympathy to Jane, John and the rest of the family. I loved working with Billy and was so happy when he moved to Colonial Heights. Billy made every day a great day. No matter what was going on or going wrong Billy would swoop in with one “your so preety” and all was ok. Billy taught us all to be happy and greatfull for everyday. My son Alex is deaf and has Autism, he is unable to speak. I loved to talk to Billy I felt like it was stuff Alex and I would talk about if we could. Billy gave me such great hope and inspiration for Alex and his future. Colonial Heights will never be the same with out him. It was with the saddest heart that I received the news of the passing of our dear, dear Billy. What a wonderful, giving and inspirational person! Billy touched the hearts of all who had the opportunity to know him. I especially know how much he meant to my Mom, Almetto Alexander and to all in our extended family. Billy made his mark! He will be missed. It’s not gonna be First Broad Street without Billy’s smiling face. I am so glad about the Prayer Garden in his honor. I wish we could all take an example from his life and conduct ourselves has he did. We would all be better for it. My prayers are surrounding his family….may peace surround you! It really breaks my heart to hear of the loss of Billy, who captured the hearts of all whom he came in contact with. He touched the hearts of “Almetto Howey Labyrinth Foundation”; its Board Members; and me especially. Billy left great memories with and for all of us at the Charlotte, NC dedication ceremony for our labyrinth project. We continue to think about Billy’s participation and how much he enthusiastically contributed to the program. He did a wonderful job putting the cards together and added so much to the Foundation program. Yes, I Mrs. Almetto Alexander will always love Billy and his family. This is what Billy has done; and has beat us to the end. He is in heaven now; with angels all around him. As I, Almetto, talked with Tom and the questions Billy asked him; it does sound as if his journey is complete. Our sympathy is with you all. Finding Billy’s website, grownmannow.com, where Billy posted about his trip to Charlotte on March 16, 2011 and described what he called a “big, big celebration”, was so touching and caring and will always be remembered by the foundation. Our sympathy is with you all. Nancy Dixon sent me notice of Billy’s new life in heaven. I am happy for him, but sad for you. I know how much you loved that sweet, special son of yours! Please know that I am thinking of you and sending you special prayers and warm loving thoughts as you and your family deal with his earthly departure. My fondest memory of Billy is when he introduced me to the ducks in your pond, Barney and Thelma Lou. I will never forget that beautiful autumn day. I love you deeply Dr. Schultz. You are my hero! God trusted you with Billy and you honored that trust so beautifully. Now you can trust God with Billy……and you. As I read all these heartfelt posts regarding your precious Billy, it brings me back to the late 80s and the kindling of my life passion- working with children, particularly those God has blessed us with who have special needs. As I reflect, I have always known that you and Billy kindled that fire in me and I am eternally grateful for the life lessons you taught me. Rest in Peace now sweet man…your work on Earth will last in many hearts forever. Jane-may you have the comfort from the One who has always been holding Billy’s other hand. I just got this sad news and know that there are many heavy hearts grieving for him. Billy Schulz added so much joy to everyone who knew him. Like Jane, he was an excellent teacher and taught us so much about what is important in life for all of us. I can see his smile and feel his warmth now even though I haven’t seen him for years. He had a joy-filled, giving life and left friends throughout the country who feel this loss to the world – a tribute to him and his family. Jane, thoughts and prayers. Not only have you lost a son, but your best buddy in the world. Billy sure reflected the beauty of life, love and family. He taught all us how to live a simpler life full of gratitude. He has forever touched the lives of thousands and will be remembered for those life lessons. Praying for you and and your family for the loss of a beautiful spirit! May his memory carry on! Regarding the Graduation at WCU, the luncheon, and the awards ceremony today where honorary degrees were conferred to Dr. Schulz and Billy, Dec 15, 2012. We had not seen Dr. Schulz or her family for many years, but today was a healing balm for us, healing our absence. Today, Dr Schulz was surrounded by loving colleagues, friends, family, and community, and so there was also God speaking to and through her. Many lovely words and thoughts and hugs were exchanged by everyone present, and we found her unchanged by these temporary physical conditions that interrupt her stride. She is the same wonderful, generous, graceful, thoughtful, loving, caring person that we so dearly remember, only more so, graced by time and tempered by the fires of the daily and yearly challenges she has faced. Dr. Billy was present there, too.